You want to make decisions that improve your yields and bottom line. We at Valley® Irrigation are here to provide you with the equipment and technology you need to achieve maximum productivity and profitability. 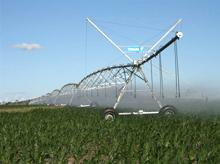 No matter your field size or budget, we have an irrigation solution for you. Since 1954, the Valley brand of center pivot and linear irrigation equipment has consistently outperformed the other brands in all field conditions. Tested for durability and strength, our equipment not only provides you with advanced irrigation choices that lead the industry, but also the best value any pivot company has to offer.